Merrier times are just around the corner. With Christmas around, many offices are busy organizing a holiday-themed party for all the employees and staff members. Talking of parties, there is going to be some spillage and if you have your office floors carpeted, it makes sense if you are worried about them getting stained. Carpet stains can be hard to clean after – especially in the office. Unlike a residential rug, you can’t bend down on the ground with a cleaning detergent in one hand and scrubber in the other or vacuum the whole place on your own. You will need professional help and that is where Extra Hands Services Inc. comes in. As professional carpet cleaners, we deal with all sorts of cleaning and use the latest technologies to ensure your carpet stays in best shape. If you are worried about any of the stains mentioned below, just know that we will gladly handle the mess for you! No party is complete without red wine. As good as it tastes, its stains are one of the hardest to clean after. But glasses do get toppled and some of it always finds its way to the carpet. But there is nothing to worry about as we shall have it cleaned before the employees return from their Christmas break. All those that abstain from drinking because they have to drive afterwards resort to a cup of coffee, chilled or freshly-brewed from the coffeemaker during the party. Parties being the perfect place to socialize with those you never a get a chance to meet unless in a board meeting, can turn sour when some of the coffee spills onto the carpet. Coffee stains are extremely easy to get rid off when worked upon instantly. However, they too can get missed out on, especially when crowded by too many people. You can send them over to us after the Christmas break and we can have them professional cleaned for you in a timely manner. Chocolates being an ideal gift for colleagues and coworkers also find their centre table in an office Christmas party. Unless molten, all one needs to do is pick it up in case it has been dropped. If you are dealing with hot chocolate shots or a chocolate fountain, spills are bound to happen. It will take little time to turn the carpet into a sticky poop-colored mess. If cleaned immediately with dishwashing liquid and equal parts water, it will prevent hardening. If not, then leave it to us. Was it blueberry pie, strawberry cheesecake, or a pumpkin tart that the company ordered as desserts? There is no need for guessing as all three, when finding their way into the carpet will not only start to stink but also leave colored stains. Not to mention the amount of crawling creepers it will attract. But again, you don’t need to worry as we have the best cleaning chemicals and equipment to get the very last sign of the stains out from the carpets and keep them as new. Beer times are also a looked-forward-to times at the offices. 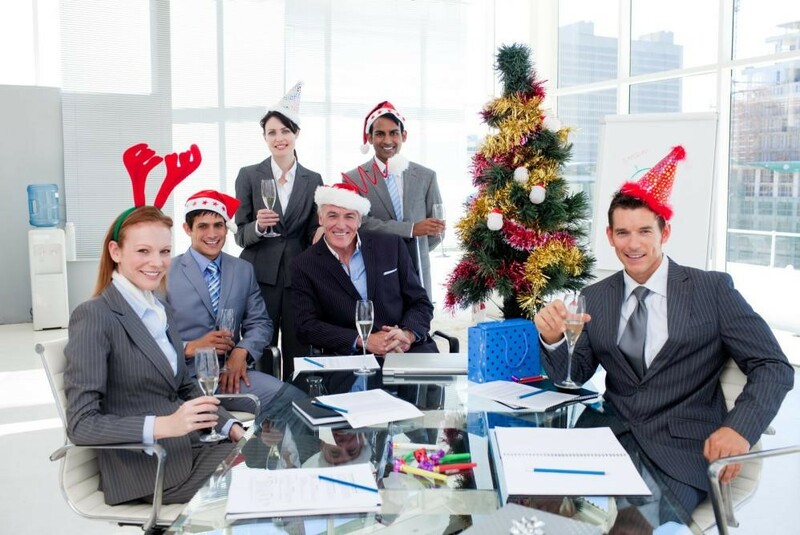 Since most offices have a no drinking policy during office hours, a party is excluded from all such rules. Second to wine, beer is a popular beverage in holiday parties. But sometimes, amidst the opening of bottle and passing of cans, they do get spilled on the carpet. The beer leaves a yellowish stain when spilled on the carpet. Even when the spot dries up, it leaves behind a weary-looking boundary as the reminder. Taking prompt action may allow you to get the most of it, but if you fail, we will have it cleaned for you!